Here are a couple more Enchanted Polishes today. 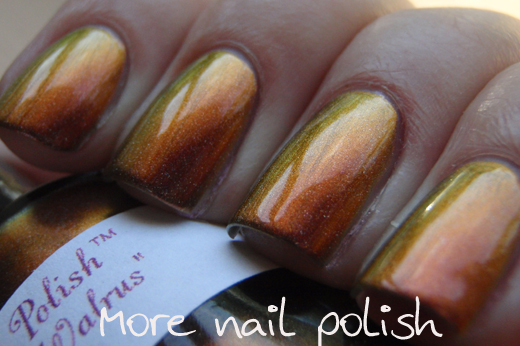 I am the Walrus is another holographic multichrome. I thought this would be quite similar to Ozotic Mish Mash 531, which it is, and it isn't. 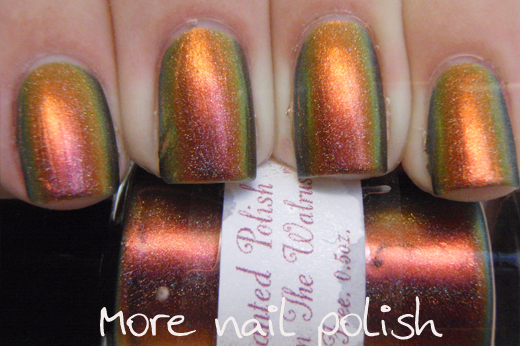 When I wrote about Mish Mash 531, I believed it was a holographic version of Ozotic multichrome 502. 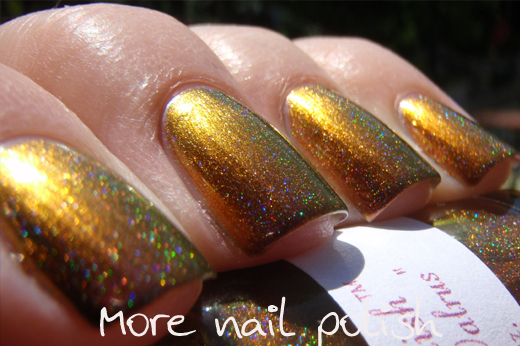 I think I am the Walrus looks more like a holo version of Ozotic 520. Of course 502 and 520 are nearly the same as can be seen in this comparison. The other big different between the Enchanted Polishes and the Ozotics, which I have said before, is the opacity of the polish. 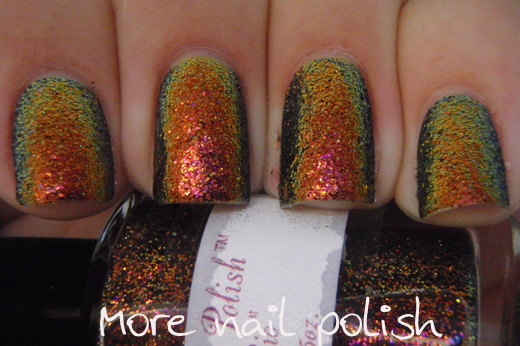 These photos show I am the Walrus at three coats on it's own. I like not having to layer these over black. 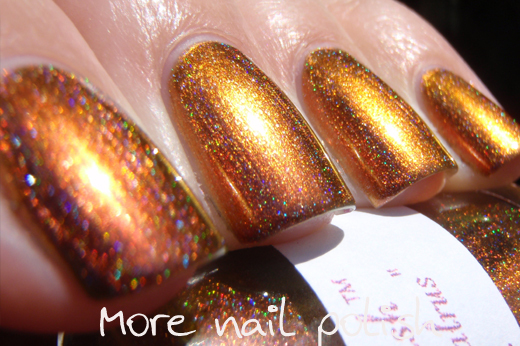 Although, the holo effect in the Enchanted Polishes is not as strong as the Ozotic ones. I am the Walrus shifts from a pinkish red through to a golden orange. These photos are taken in full sun. 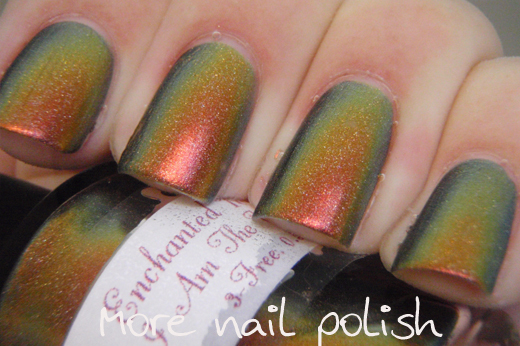 In the shade you don't see the holo effect, but the multichrome colours really come out. 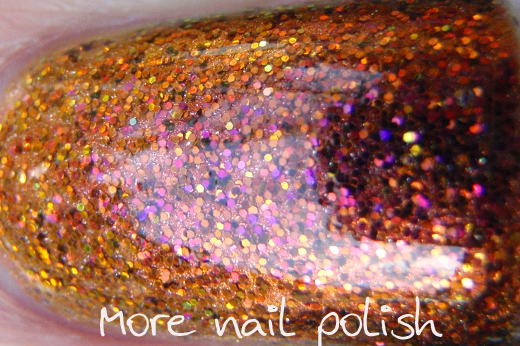 To bring out the full spectrum of the multichrome colours, here are some under water photos. Next I added Ola, Rio on top. 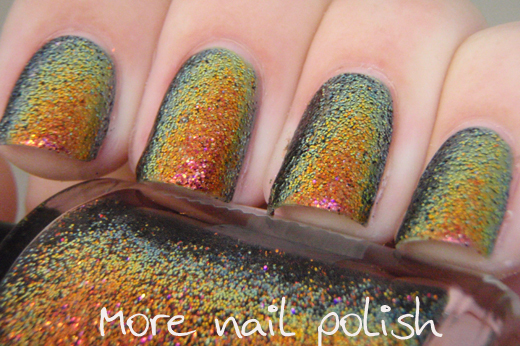 Ola Rio is a multichrome glitter like the Ozotic Elytra 530 and Hits Airglow and it is packed with glitter. The Ozotic version is a little sparse, but this is excellent. 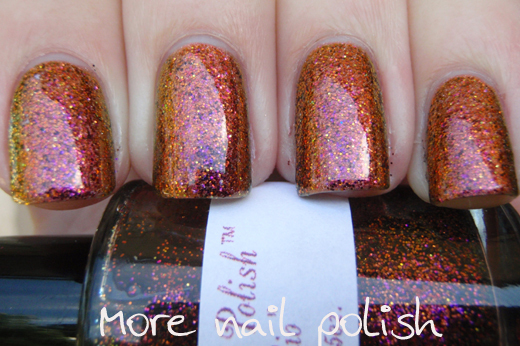 The colour shift in this glitter is the same as Ia m the Walrus, going from pinky red to golden orange. Finally, some extra underwater shots to show the awesomeness. As you can see, my bottles are the old version with the paper labels. 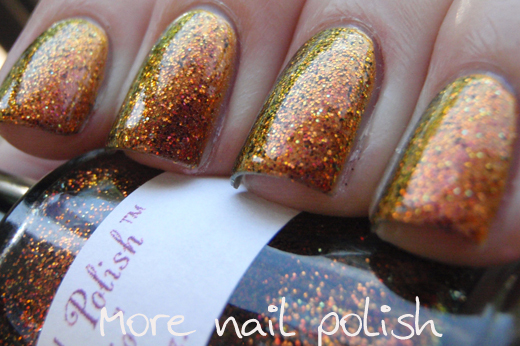 Enchanted Polish how has gorgeous bottles with a printed castle emblem on it. I really like I Am The Walress but only on it's own - not crazy about Rio over the top of it (or maybe not Rio over the top of anything - not sure)..maybe you can show up Rio over something else later down the road. 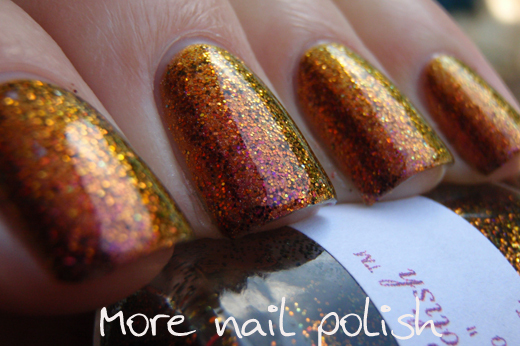 You own the prettiest polishes, and you take fantastic pictures of them! 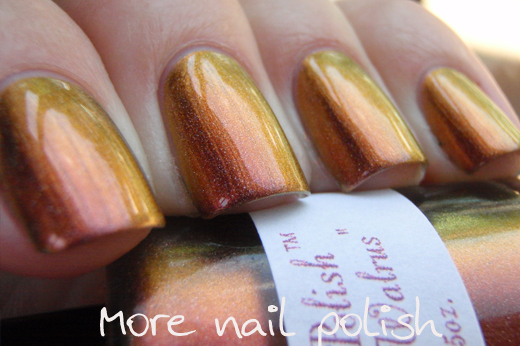 How perfect to see two such matching polishes in such different finishes. The swatches are as amazing as ever the way you can capture the shift.